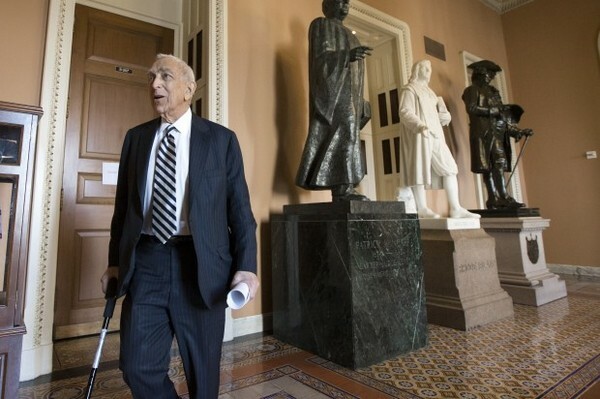 WASHINGTON (AP) -- U.S. Sen. Frank Lautenberg, a multimillionaire New Jersey businessman and the last World War II veteran remaining in the Senate, has died at age 89. His office said Lautenberg died shortly after 4 a.m. EDT on Monday at a New York hospital after suffering complications from viral pneumonia. Lautenberg, who had been called out of retirement for a second tour of duty in Congress, announced in February that he would not seek a sixth term. The Democrat had health problems in recent years and had missed several Senate votes in the first months of the year. He had the flu and missed the Senate's Jan. 1 (2013) vote to avoid the so-called fiscal cliff of rising taxes and falling government spending, then missed several votes two months later because of leg pain. A chest cold kept him from attending a May 29, 2013 tribute in New York honoring him for his contributions to the Jewish community and Israel. He had been diagnosed in February 2010 with B-cell lymphoma of the stomach and underwent chemotherapy treatments until he was declared in June 2010 to be free of cancer. He worked between the treatments. The diagnosis came just days after the death of West Virginia's Robert Byrd made Lautenberg the oldest member of the Senate. Republican Gov. Chris Christie would appoint a successor to Lautenberg. Lautenberg was a staunch gun control advocate and frequent critic of the tobacco industry, and he fought for greater government spending on transportation and the environment. He wrote the laws banning smoking on domestic airline flights and setting the national minimum drinking age of 21. Along with Lautenberg's legislative accomplishments, he had a string of electoral coups, including an upset over someone he called "the most popular candidate in the country" in his first race for Senate, and a victory in a strange, abbreviated, back-from-retirement campaign 20 years later. He initially retired in 2000 after 18 years in the Senate, saying he did not have the drive to raise money for a fourth campaign. He served on the boards of three companies, two graduate schools and the U.S. Holocaust Memorial Museum. But New Jersey Democrats recruited Lautenberg out of retirement in September 2002 as an 11th-hour replacement for Robert Torricelli, Lautenberg's longtime rival, who had abandoned his re-election bid just five weeks before Election Day. Republicans went to court to prevent what they called the Democratic Party's ballot "switcheroo." When that failed, they attacked Lautenberg as a political relic ill-suited for dangerous times. But Lautenberg surged to an easy win over Republican Douglas Forrester and returned to the Senate in 2003 at age 78, resuming his role as a leading liberal, and he made it clear that his return to office was no mere cameo. When Democrats regained a Senate majority in 2007, he returned to the powerful Appropriations Committee, on which he had served for 15 years. At age 84, he beat back a Democratic primary challenge in 2008 and went on to another easy win in the November general election. It made him the first New Jersey person ever elected to five Senate terms. "People don't give a darn about my age," Lautenberg said. "They know I'm vigorous. They know I've got plenty of energy."